Your Best Choice for Brochure Design, Printing, and Mailing Services! Make your next brochure project a breeze! We build and ship brochures under one roof with FAST turnaround times and FREE local delivery. Choose the printer with over 30 years of excellence, trusted local customer service professionals, an award winning in-house design staff and the most affordable mailing service in the area. If you're looking for a Business Brochure or Personal Brochure printer in North Carolina, you've come to the right place! 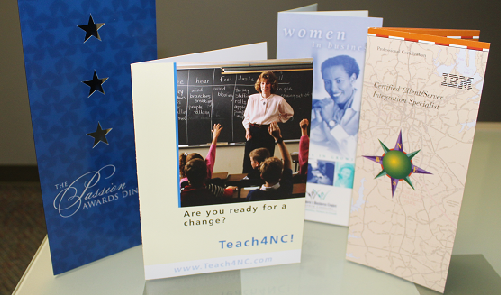 We've been printing Brochures for businesses in Durham, Raleigh, and Chapel Hill and around the globe since 1979. We offer quality, eco-friendly stocks, and the fastest turnaround times in the business. Have us tailor a quote that meets your budget and needs, whether a few digital brochures or several thousand printed on our six color printing press. We offer only the best printing methods and services that will make your brochures stand out and exude quality. Handouts, menus, info sheets, or mailers are a popular way to reach your customers and keep them informed, so have us help you get started on a project today. Just give us a call at 919-361-5809, request a free estimate online, or stop by and speak with a printing specialist today! I had no idea color copy machines could provide such exceptional quality for cheap until Universal Printing delivered my beautiful menu brochures. Paul helped with the layout, which was an unexpected surprise, and he helped me find an affordable alternative to your standard white paper. It was environmental paper, and more cost effective! I recommended Universal to my boss! We had numerous customization requests with our Multi Channel Marketing campaign which Universal accommodated with ease. Implementation of their Symphony software contributed to a very profitable season. They successfully promoted our product to thousands of prospective clients !